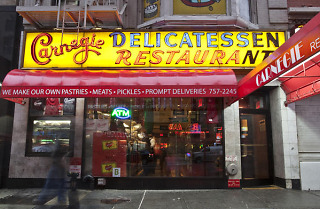 Thanks to The Marvelous Mrs. Maisel, the marvelous Carnegie Deli will be back for eight days this December. 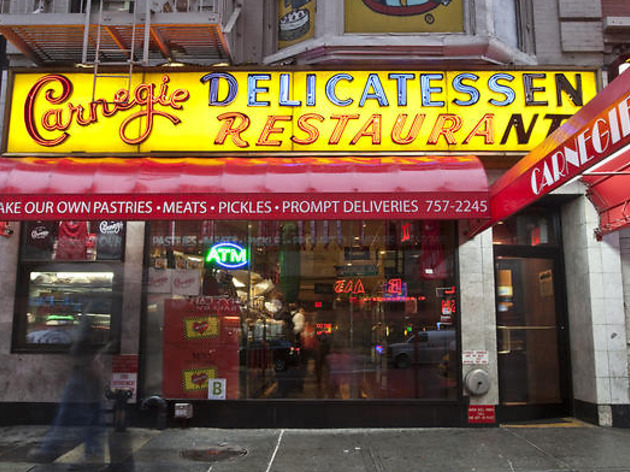 The famous, eight-decade-old deli that shuttered in 2016 is returning for a brief stint in a different location (201 Lafayette Street) from December 1st through December 8th. And in order to make it period-appropriate to fit the TV show, the shop will be decked out in 1950s style, including old-school ingredients, vintage cars outside, branded menus and 1950s prices, like 99-cent sandwiches. One of the sandwiches is "The Midge," made with Carnegie pastrami, salami, coleslaw and special sauce stuffed into rye bread slices. There will also be turkey sandwiches, cheesecakes and black-and-white cookies, naturally. The pop-up is a collaboration between the deli's former owners and the show's production team so they could get the deli details just right to promote second season of The Marvelous Mrs. Maisel, which takes place in 1950s New York City. You can book a reservation here, or stop by the takeout counter from 11:30am-8pm every day of the pop-up. All of the proceeds go to the Lower East Side Girls Club, promoting arts, leadership and wellness for middle school and high school girls. Midge would be proud.